I have made two new friends since moving into our house that I have yet to blog about. They are always bright and cheerful and ready to help me whenever I need it, which is almost everyday. I love these friends. They always light up when they see me. They even sing a happy little tune when their work is done. They save me money on water, energy, and detergent. Who could ask for a better friend? It would be nice if they could sort and fold the laundry too but that's probably asking too much. I have yet to learn their names but here's their picture. Does anyone have any name suggestions for my new friends? They already have the initials of L and G.
Cute! Very nice new friends! 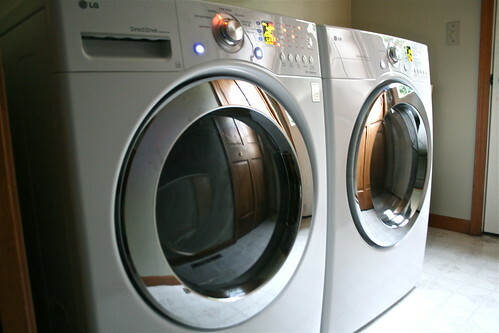 At my house, we call them "Washer" and "Dryer" but we have no imagination. How about "Somebody" and "Nobody"? As in, Did Somebody do the laundry? And Nobody put the laundry in the dryer.